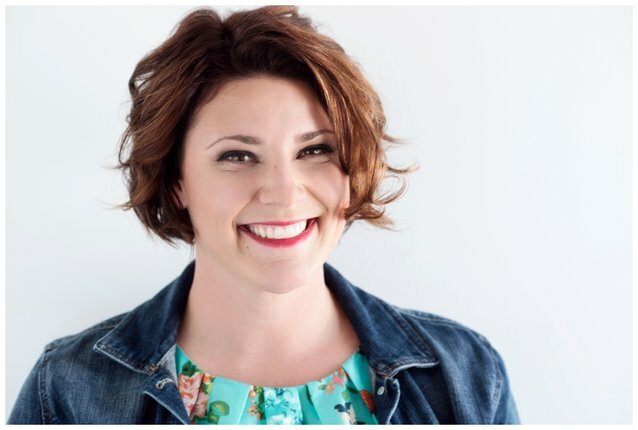 J is for Joelle: I got one...I GOT ONE, I GOT ONE, I GOT ONE!!!!! I got one...I GOT ONE, I GOT ONE, I GOT ONE!!!!! Tonight after what felt like the longest day in recorded history, packing and sorting and moving Jason and I went for dinner. I wish I could say we sat and enjoyed each others company the whole meal. What actually happened was I was sorting kids stuff and reading report cards off my phone and Jason was reading the inspection report on the house off his phone. But tonight, it all went away. 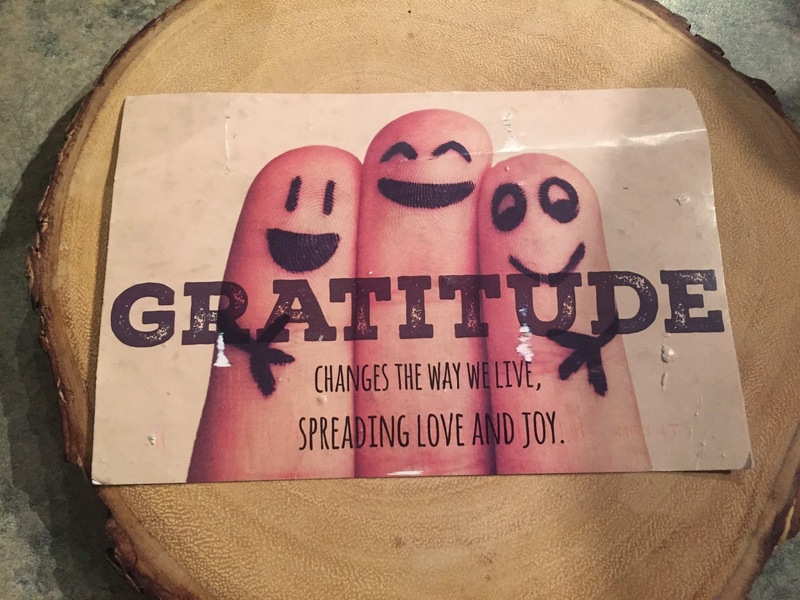 A few weeks ago I started the Gratitude Project and I wasn't sure it would go anywhere. I have left postcards around three cities and was trying to not get too disappointed that non had returned yet. While Jason and I drove back from dinner tonight to collapse into bed from our long day I had a thought, maybe we should stop off at the post office, and I am so glad we did. I GOT ONE, I GOT ONE, I GOT ONE!!!! It is pretty badly beaten up, but it arrived. 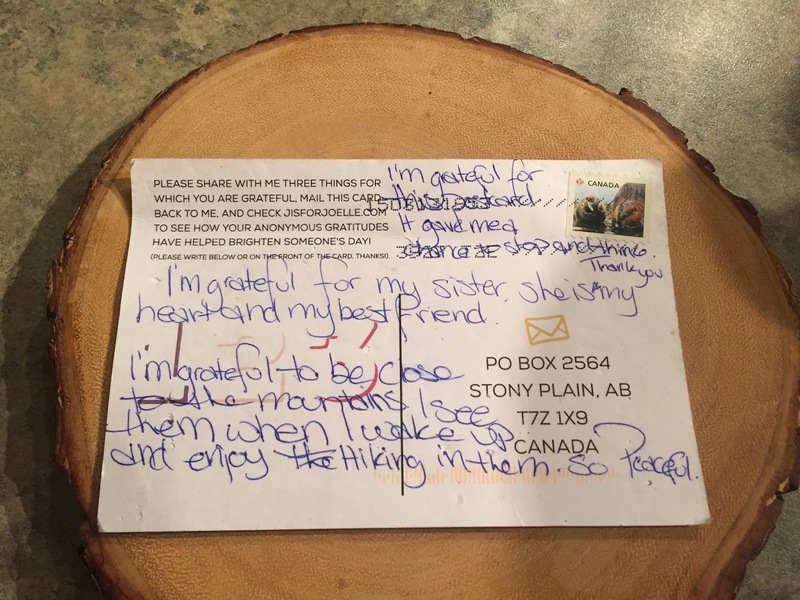 My first postcard has returned and I am over the moon thrilled! 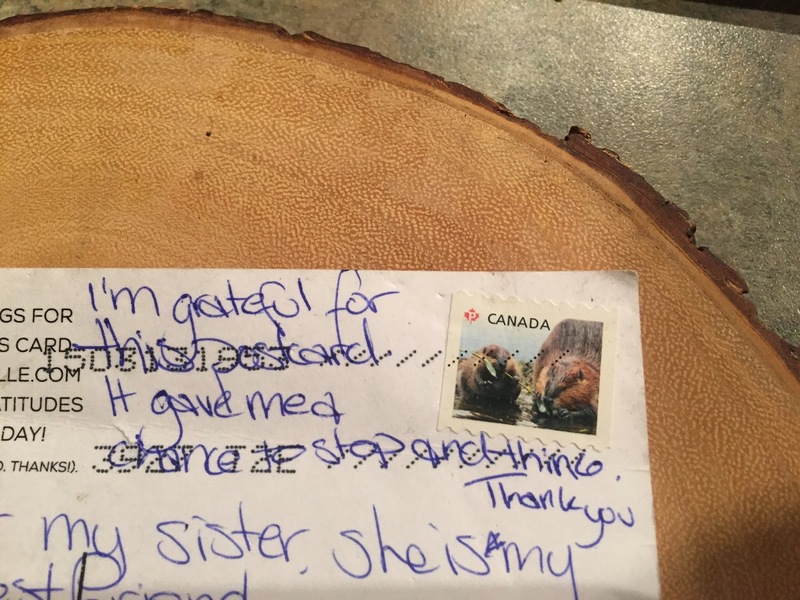 It says; I am Grateful for my sister. She is my heart and my best friend. I am grateful for the mountains, I see them when I wake up and enjoy hiking in them. So peaceful. And my favourite part says, at the top, I'm grateful for this postcard, it gave me a chance to stop and think. Thank you! Every single penny spent and moment of time used to make this come together...worth it. I am so happy I have almost completely forgotten that I have to buy a new washing machine! I am grateful for this week and last week finally being over. I am grateful for Drew and R's safe return from Mexico and that they are making a full recovery. I am grateful Jason is home, and for him. 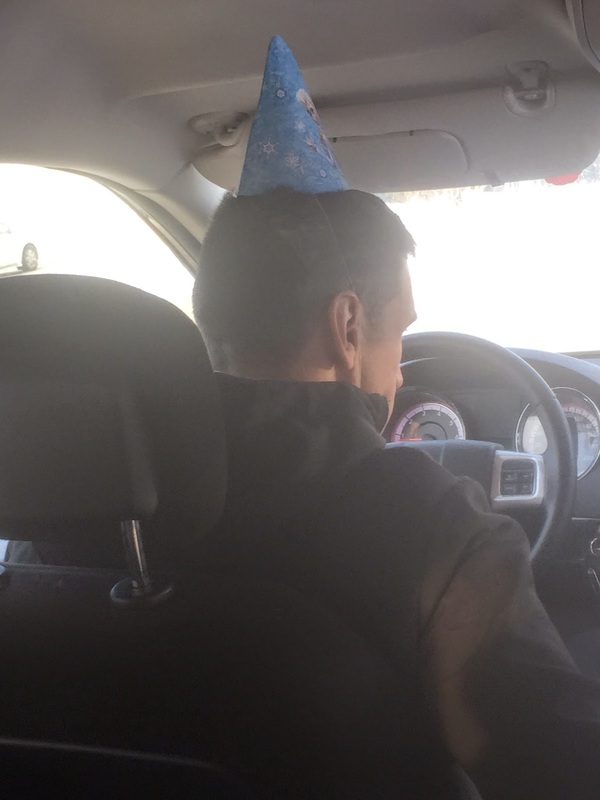 Who wouldn't love a guy that drives the teenage and preteen kids to school wearing Noras birthday party hat just to make them smile. Tonight, I am so grateful!